Hooray for fall! I don’t like the gloomy weather and rain. But we’ve had some nice sunny, but cool and crisp days that have been absolutely beautiful. But my two favorite things about fall are the beautiful colors (Something I didn’t get for years in Hawaii) and the yummy food! The leaves are so gorgeous this time of year. It’s a great time for photos, that’s how Sharon got these beautiful engagement photos of us! But it’s also time for pumpkins, and pears and fantastic fall flavors. Like this salad. I got the basic recipe here, and changed it up slightly with what had on hand. 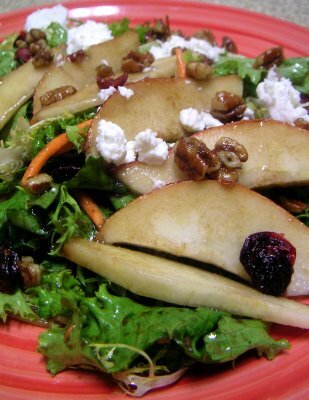 Assemble salad by tossing greens and pear slices in a large mixing bowl with maple-balsamic dressing. Top with goat cheese and candied pecans. UPDATE: I’ve entered this post in the Art You Eat contest!